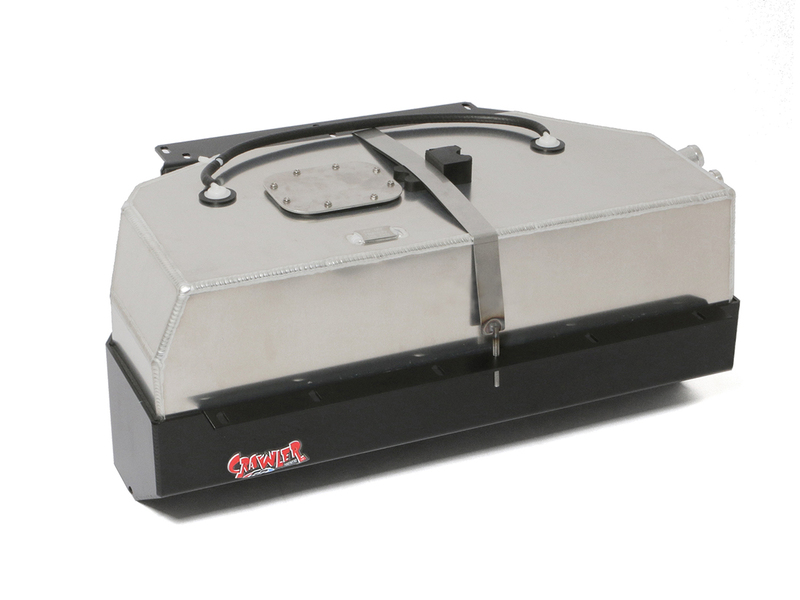 This is the Crawler Extended Range Gas Tank to fit a CJ-7 and CJ-8 (1974 to 1986) models. This is perfect for those guys who are stuck with the stock 15 gallon tank. This tank holds an Extra 5 gallons of fuel And still fits in the stock location in a Jeep CJ-7 for those long distance trips. Sorry No axle move back possible with this model tank and ground clearance is the same as stock CJ tank skid. For a tank with similar Features but Will allow some axle relocation and better ground clearance see the EXT for the CJ which allows for Bigger Rear axles and up to 5 inches Stretch! This New tank Will accept the factory CJ fuel pick and sending unit BUT it was designed to accept the factory Jeep YJ in-tank fuel module which is better for those guys who have converted their Jeep over to fuel injection! Each tank is supplied with a Blank adaptor plate for those guys who want to continue running the factory fuel pick up/sending unit.